Wilderness recreation versus agricultural irrigation values clashed. 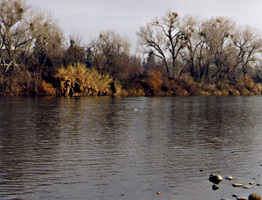 A levee on the Sacramento River. The Oak Savannah woodland that thrives in semi-arid regions. These associations are needed for aquifer recharge that replenishes the ground water that is in such short supply in California. The exhaustion of groundwater in the 19th century led to the creation of irrigation districts to bring water from the high alpine mountains to the deserts and semi-arid regions that make up most of the state. "Nothing better illustrates the relationship between dramatic alteration of the waterscape and piecemeal reform than the struggle to preserve the awesomely beautiful and rugged stretch of the Stanislaus River, a stream that rises in the Sierra Nevada, north of Yosemite, before eventually joining the the San Joaquin River west of Modesto." 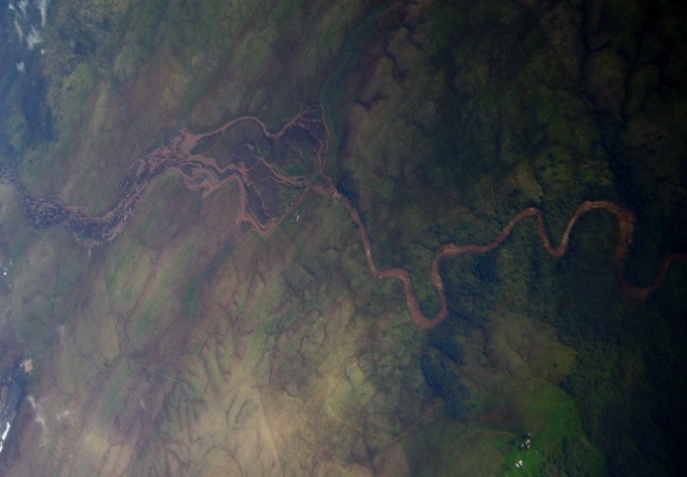 A river, in flood stage, snakes its way through forested the foothills of the Sierra Nevada, 2005. New Melones Dam was approved in 1944, as part of the Central Valley Project. "to be built by the Army Corps of Engineers and managed by the Bureau of Reclamation." "The nation's fourth highest structure that would flood twenty-six miles of the Stanislaus, an amazingly beautiful stretch that included one of the country's most boated white water rapids." "Even before water could back up behind New Melones, opponents had transformed the struggle into a national fight." state ballot initiative 1974: Proposition 17 -- "to quash the proposed dam." "The initiative proponents ran head-on into formidable resistance from water leaders at all levels of government as well as agribusiness, Pacific Gas and Electric, the California Chamber of Commerce, and the contractors working on the New Melones, all of whom insisted they were the Stanislaus' true friends...."
Brown squeaked to victory (despite his endorsement of Proposition 17 against the Dam) but the initiative, at least in part reflecting the power of money and television, lost, though only barely so (53 percent to 47 percent)." "A subsequent poll revealed that most voters had become confused by conflicting campaign ads--"
"Defeated at the polls, the opponents now pinned their hopes on the courts." Water Resources Control Board "acknowledged Stanislaus Canyon as a 'unique asset to the state and nation' "
Salinas River: Water is worth more than gold in the arid western lands. 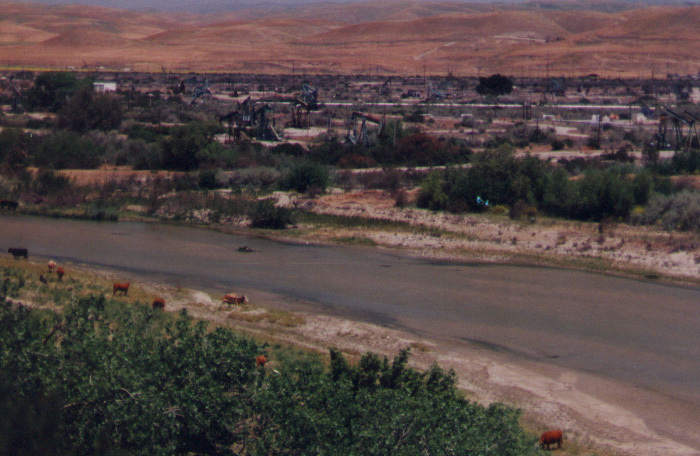 When circuit court ruled in favor of the Bureau of Reclamation, the Water Resources Control Board appealed to the Supreme Court. California vs. United States ,1978. "In a decision...with implications for state attempts to set water quality standards for the delta, the court concluded that the Reclamation Bureau had to 'follow state law in all respects not directly inconsistent with' Congressional intent." A series of legal challenges ensued as the questions of law were remanded to the lower court to adjudicate. The opponents now shifted their attention to Congress, which had the authority to halt construction or reduce the dam in size that did not endanger the canyon." "In a dramatic gesture, one of the river rafters, Mark Dubois, in May 1979 chained himself to bedrock near the rising water level."
. promised to sign any bill preserving the river." In Congress, "The Republicans lined up solidly against the Stanislaus..."
"Since preservationists nationally had joined in the campaign, the Stanislaus emerged as a new rallying cry and source of inspiration across the United States." "People began to talk more about the joy, the wonder, and the spirituality brought by rivers,' noted Tim Palmer, a member and chronicler of the movements to save the Stanislaus and other endangered rivers." "The Stanislaus brought our feelings of reverence for the natural world, where rivers are a source of life and a center for attention. The river was a sacred and holy place." "now rivers had clearly joined that group of wonders deserving protection." for more than just preserving land and biotic communities. "the rivers could be as sacred as the wilderness areas through which they flowed."